Pimenov was looking for his artistic style for a long time: at first it was German expressionism, then impressionism. The artist came to the modern realism at an evil age and carried it with him through his whole life. Pimenov is a master of capturing short moments of life, which happen daily and remain unnoticed from the apparent routine. The artist is madly in love with Moscow, not so much as a city, as much as his homeland. Hence the warmth and liveliness in each plot depicted. In the painting “Wedding in tomorrow’s street” traced the tenderness and specificity of the artist. The plot is similar not so much to the picture as to the frame of the film of the past sixties. 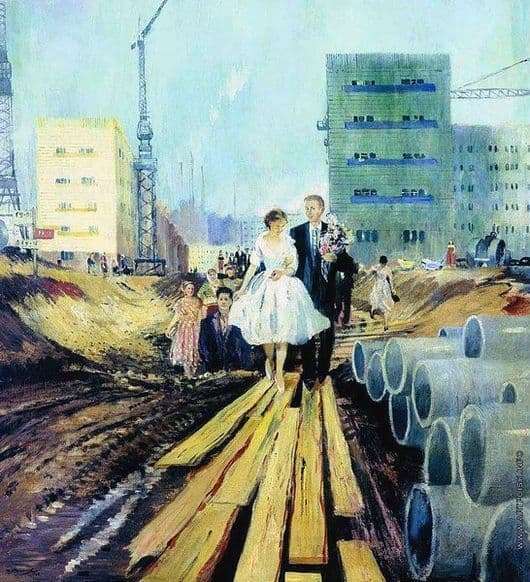 Pimenov aims the viewer at the prospect of life: newlyweds, building, a long bright street. The most noticeable spots on the picture are the dress of the young bride and the new house. All new, light is the artist the world. Despite the fact that in the manner of writing Pimenov there are no clearly defined details, the picture does not suffer from this. The artist so skillfully plays with colors, focuses on the bright warm colors that the plot seems to be completely complete. In the “Wedding on tomorrow’s street” the figures are abstract, therefore they cause nostalgia among the youth of the sixties: everyone can see himself on the canvas of the author. Pictures of Pimenov – a chronicle of the past era, but not static and dry, but bright, cheerful, noisy. The artist’s quivering love for ordinary citizens of his country lives in his paintings today. Pimenov was versatile in kind. During his life he glorified himself not only as an artist, but also became a famous stage designer, as well as the author of several books.